Weekly Blog 17 26/11/2018: What’s brewing? We’re back again for our weekly update! On Saturday Harry and Jonah lent a hand and brewed Textbook IPA with Paulius. Members, if you fancy getting involved then keep an eye out on your emails. We’ll announce another brew day soon! Our special news this week is that Heineken are on campus on Thursday! They’re going to be giving a presentation and host a Q&A with regards to their latest graduate schemes, 1) The Business Leadership Graduate Programme and The Brewery Operations Future Leaders Programme. These both are a great way to fulfil a career in the brewing industry. Let us know whether you’re going to come along by responding to our facebook event. 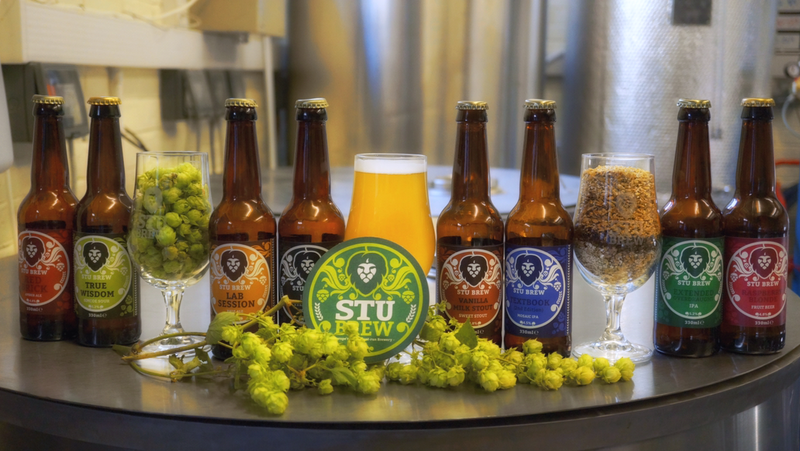 After the talk the Stu Brew committee will be giving you the opportunity to give us direct feedback on the society this year in the form of a Q&A session. Here’s your chance to tell us what you think of how we’re doing. Is there anything we could do better? Do you have something you’d like to see us organise? We might even have a little surprise for those of you who stay for our Q&A in the form of a cold refreshment! Here’s a few of the team… getting a full group picture proves rather hard when half of the committee are camera shy! Have a great week and we look forward to seeing you soon.